C1525. 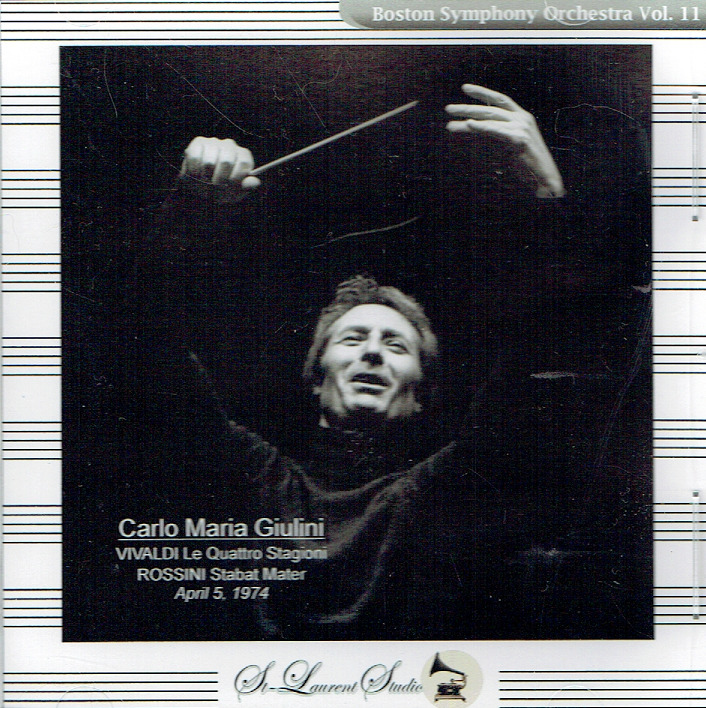 CARLO MARIA GIULINI Cond. 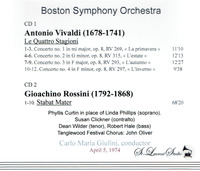 Boston Symphony Orchestra: Le Quattro Stagioni (Vivaldi); w.Phyllis Curtin, Susan Clickner, Dean Wilder & Robert Hale; Tanglewood Festival Chorus: Stabat Mater (Rossini). (Canada) 2-St Laurent Studio YSL T-492, Live Performance, 5 April, 1974, Symphony Hall, Boston. 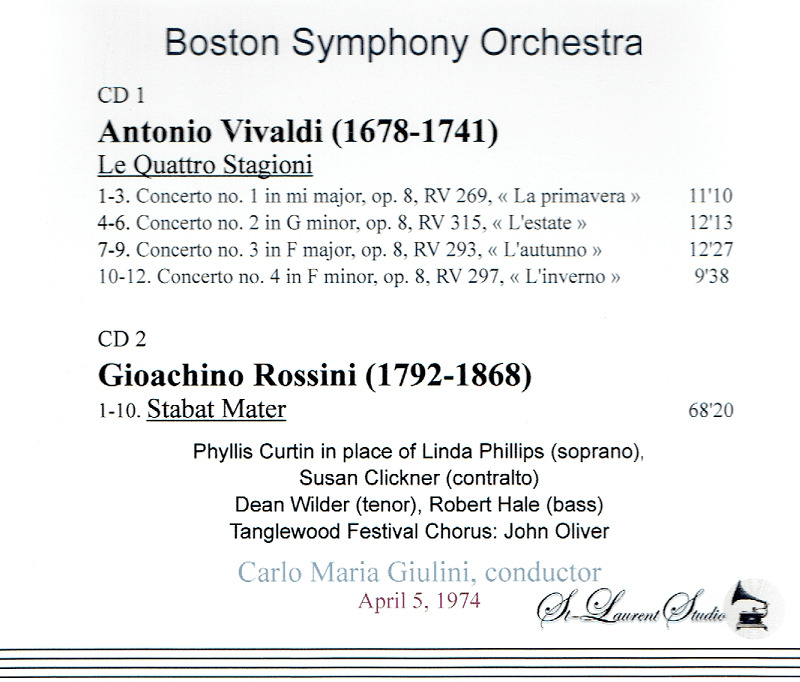 [Beautifully displaying the splendor of the Symphony Hall acoustic; Linda Phillips cancelled at the very last minute, and Boston-based soprano Phyllis Curtin substituted for her to save the performance.] Transfers by Yves St Laurent. In the standard repertoire, Ms. Curtin was widely praised for her Mozart - she sang all of his major heroines over time - and for the title role in Richard Strauss’ SALOME. Her other notable roles included Violetta in LA TRAVIATA and Alice Ford in FALSTAFF, Ellen Orford in Britten’s PETER GRIMES; the title role in Darius Milhaud’s MÉDÉE; and Cathy in Mr. Floyd’s WUTHERING HEIGHTS, a part she created at the Santa Fe Opera in 1958. Ms. Curtin also sang at the Metropolitan Opera, the Lyric Opera of Chicago, the Vienna State Opera, Covent Garden and La Scala. She appeared in concert with the New York Philharmonic, the Boston Symphony Orchestra, the Philadelphia Orchestra and other major ensembles. Writing in THE NEW YORK TIMES in 1998, Anthony Tommasini described Ms. Curtin as an ‘estimable American soprano, who has achieved notable success and respect throughout the field but never quite the recognition she deserves’. The reasons for this seem to reflect the difficulties faced by many American opera singers of Ms. Curtin’s era, when a European background was considered the sine qua non for landing contracts with major United States companies. What was more, as Ms. Curtin told it, her career was hindered by a set of backstage machinations as Machiavellian as anything in opera. Ms. Curtin made her Met début in 1961 as Fiordiligi in Mozart’s COSÌ FAN TUTTE. (‘Now Phyllis Curtin is at the Met, where she should have been a long time ago’, THE NEW YORK HERALD TRIBUNE wrote.) But after that, the company’s imperious general manager, Rudolf Bing, engaged her only occasionally. Ms. Curtin, who continued to perform well into her 60s [and] starting in the mid-1960s, she taught for 51 years at Tanglewood, where her students included the future opera stars Dawn Upshaw, Cheryl Studer and Simon Estes.